Almost anyone who would be reading this column has heard of the airship Hindenburg, and of the terrible fate that it, it's crew and it's passengers suffered in that field in New Jersey in 1937. Very few people however, have heard of the airship Roma, which met a similar fate some fifteen years before. Built in Italy in 1919, the Roma's speed, its payload and its range had drawn attention throughout Europe and finally the attention of the US government, which purchased it for the Army in 1921. 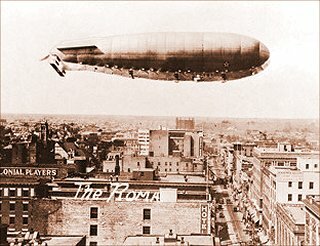 The Roma was at that time the largest semi-rigid dirigible in the world and she cost the United States $200,000 in 1921 dollars. The craft was almost inconceivably big, and by the standards of the day, breathtakingly fast: 410 feet long, 92 feet tall, capable of hauling passengers and cargo at a mile a minute. It had an astonishing 42,000 pounds of lifting capability. The semi-rigid construction was a compromise between zeppelins, which owed their distinctive cigar shapes to a light metal skeleton beneath their fabric skins, and blimps, which depended on the pressurized gas within their skins to maintain their form. It lacked a skeleton, but its gasbag was held somewhat in shape by a metal-ribbed nose cap and a rigid keel that ran along the bag's underside, from nose to tail. This keel housed the control room, navigation space, passenger cabin, the outriggers on which the engines rode, and - far astern - a huge, box kite affair that served as the ship's rudder and elevator. In addition to the 11 cells of hydrogen within its skin, it housed six cells of air, called ballonets, into which additional air could be pumped if the gasbag drooped or flattened. After delivery to the US Army in 1921, the Roma was found to be underpowered by US standards and the airship was delivered to Hampton Roads, VA where the engines were changed from the original Italian Ansaldo engines to the 400 horse power American Liberty engines, of which the Army had an almost unlimited supply from the Great War. The refitting complete, the Roma's commander, Captain Dale Mabry, called a celebration for the night of February 20, 1922, the evening before the airship was to make it's maiden flight with the new engines. A formal ball was held at the base and was attended by the crew, resplendent in their dress uniforms, and selected guests from the newspapers and the town. The next morning the Roma made it's last flight. Accounts of survivors and of eye witnesses as to what had happened appeared to agree that the huge kite-like structure of the stern rudder, itself as large as a bombing plane, had slipped to one side as the Roma drove along a thousand feet above the army base. An official list of the survivors, dead and missing in the Roma disaster was received from Langley Field by the army air service on Tuesday night following the accident. 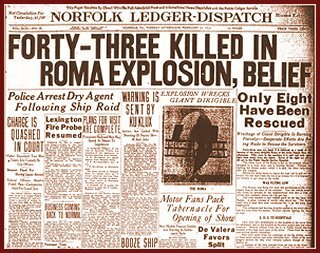 Thirty-four men were killed, eight were injured seriously and three were injured or only slightly bruised when the giant army airship with her crew and a number of civilians, totaling 45 in all aboard, plunged from a thousand feet or more in the air to the ground at the Hampton Roads Naval base. 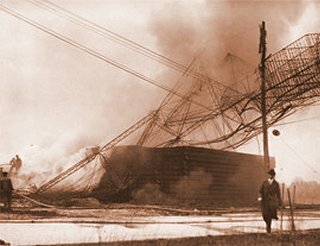 The accident presumably was caused by a broken rudder and as the big dirigible plunged to earth it capsized across a high tension electric line bursting in a roaring furnace of blazing hydrogen gas. Long after dark that Tuesday night many hours after her fall, the ship was still a mass of flames from end to end of her 140 foot mass. The fire fed on the million cubic feet of gas which had distended the great bag for the flight and made all attempt at rescue futile. Barely a dozen of those aboard were picked up alive and one of those died on the way to the hospital. All of those who survived the fire escaped by jumping as the ship struck. The others penned in the hull were burned to death. I learned about the Roma many years ago, not from reading history, but rather first hand from my uncle, Harold Holmes, who married my Aunt late in life, after both had been widowed. When he found that I was a flyer, he told me the story of the Roma and about his brother, Sergeant James Holmes, who had been a crew member on that fateful morning. He was killed along with most of the rest of the people on board. When I questioned him for more details, he told me to go look in a chest in an outbuilding and I would find a newspaper account of the accident. I remember standing above the opened locker in the dim light of the outbuilding, looking down into it. It seemed filled with his dead brother's possessions and I had the very strong feeling that it was a time capsule rather than an old wooden chest that I had just opened. Lying at the very top of the chest was his brother's dress uniform, with the distinctive insignia of the Army Lighter Than Air Corps. As I unfolded it to get a better look, I heard paper crinkle in an inner pocket. There have been occasions in my life when fear caused the hair on my neck to stand up, but on this occasion it was the pure intensity of the moment that caused it. It was the realization that there in that shed, I had literally reached back and touched the past. For a long moment I just stood there in the soft light of the shed, numbly holding in my hands, probably the first hands to touch it since the ones that placed it there, Sergeant Holmes' formal invitation to the Roma Ball.